I'm very pleased to announce that I have recently finished working on my fourth book cover artwork collaboration. 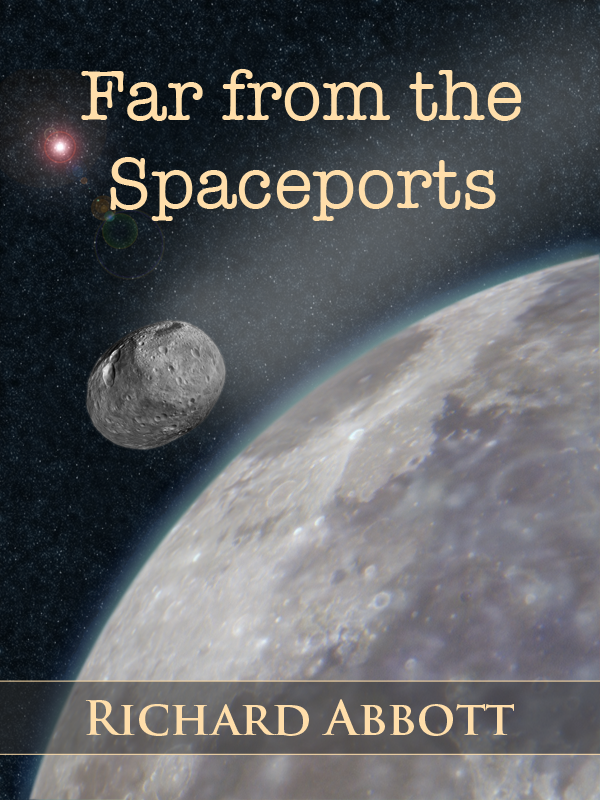 Far from the Spaceports is the first in what I hope will be a long series of science fiction novels written by my good friend Richard Abbott. The book is set in the Scilly Isles. No, not the archipelago off the south west tip of Cornwall in the UK, but their fictional namesake - a handful of asteroids bunched together in space, well outside the orbit of Mars. After quite a few discussions with Richard, we decided that the cover for the book had to convey a sense of remoteness, and a certain coldness. The asteroids in question are very isolated, don't have a breathable atmosphere, and don't have any body of water on their surface. This was good in a way as it meant a restricted colour palette could be used to set the scene - bright blues and greens were definitely out! This is the first book cover I've collaborated on where none of my photography was used. This was a huge step for me as it meant everything had to be generated from scratch using Photoshop. Whilst I consider myself quite proficient at using Photoshop for adjusting levels, balancing exposures and cleaning up dust spots on my photographs, generating artwork is an entirely different skill set, and at the start I encountered a huge learning curve. However, as I got to grips with Photoshop and some of its amazing tools, the cover started to take shape. Pretty much from the start we hit upon the composition with the star field in the background, the solar flare behind the title, the large asteroid in the foreground and small asteroid flying past leaving dust in its wake. Unfortunately, however I seemed to render or paint the asteroids with textures, they just looked wrong! Yeah, I know it's obvious that asteroids are not flat, but it hadn't occurred to me to try and curve a texture before applying it to the image! Once that first breakthrough was made, the large asteroid started to look a lot more realistic - and a lot less disc like. The key step though was to use real textures, provided courtesy of NASA and their fantastic Public Domain image archive. The small asteroid is actually based on an image of a real asteroid called Vesta. The large asteroid is based on a blend of images of Vesta and the Moon! I have to admit, even though it was a lot of work, I really enjoyed creating this cover with Richard. I learned a lot of new skills and feel a lot more confident when it comes to using Photoshop. I wish Richard every success with the book, and hope to work with him again in the future. Why not read my review of the book here?